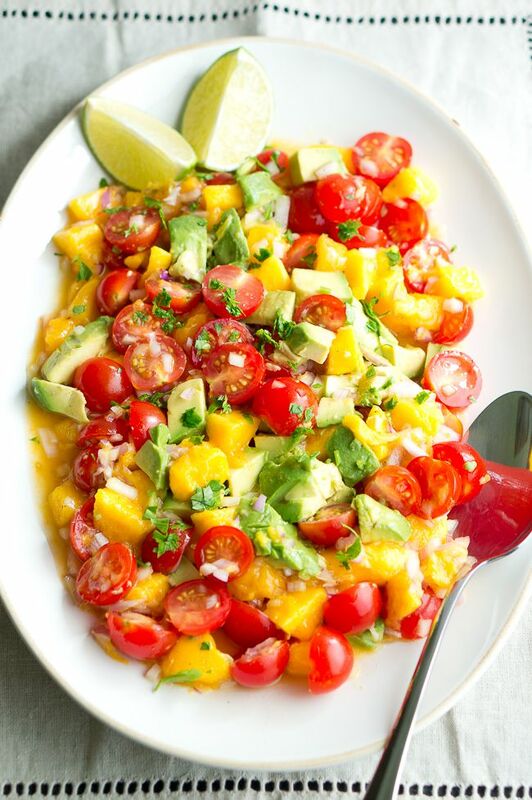 This mango avocado salsa will transform any simple weeknight meal into a special dinner. I love to serve it with baked salmon but it’s also great with any white fish or even with pork chops or chicken. 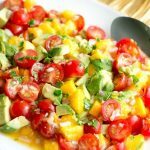 It has a very refreshing summer flavor – mangoes, avocados, cherry tomatoes, red onion, and freshly squeezed lime juice. 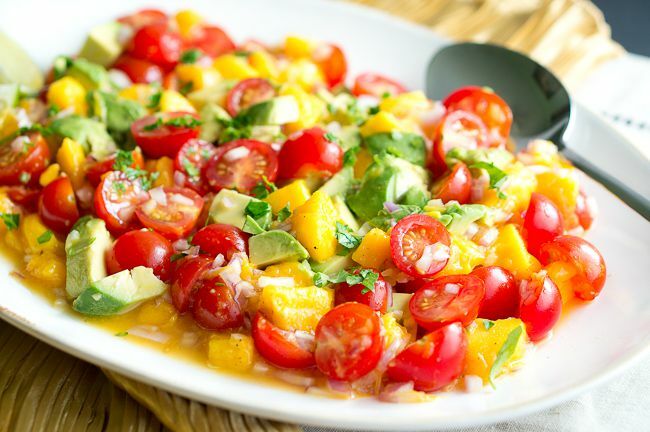 This salsa tastes fantastic – exotic, sweet and savory. (Trust me, it’s soo good!) Perfect for those last summer days. 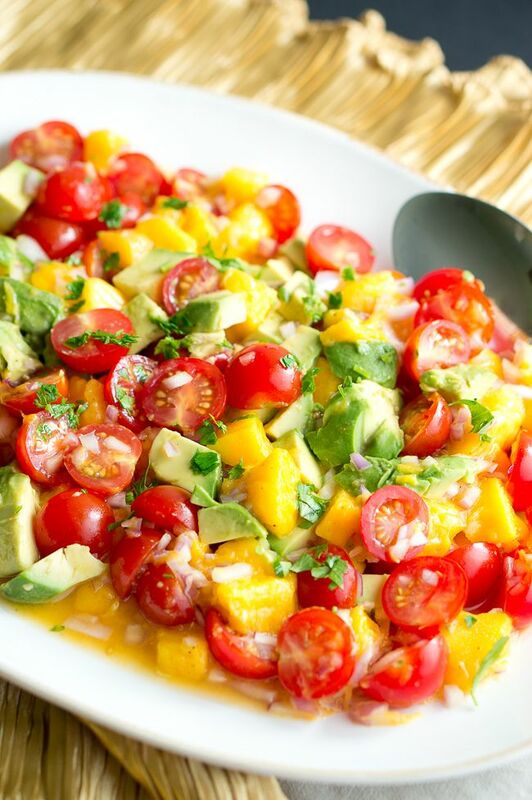 This mango avocado salsa makes enough for about 5 – 6 people, depending on your appetite. What I really love about this side dish is that it’s ready in less than 15 minutes and can be done while your salmon is cooking. You can have dinner on the table in about 20 minutes, and leftovers make an easy lunch for next day. Win, win! My husband gobbled this all up. He gave it two thumbs up!! Hope you like it too! 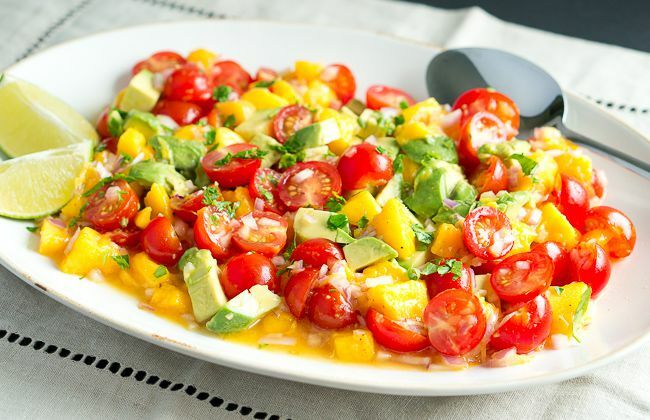 Mango Avocado Salsa will transform any simple weeknight meal into a special dinner. I serve it with baked salmon but it's also great with any white fish. Gorgeous!!! Love this flavor combo, what a quick dish! This wouldn’t last long at my house! This looks wonderful! I can just taste that burst of fresh flavor in my mouth, yummy! Love, love all these flavors together – so fresh! And the colors? Like a mini work of art on a plate! Really nice! Love how fresh and absolutely eye appealing this salsa is – I have no doubt I’d make a big dent in it! I love salsas, this sounds like a wonderful combination and the colors are gorgeous!